The Miami Heat are running through the NBA playoffs like the Kool-Aid Man running through a brick wall, sweeping Charlotte in the first round and taking the first two games from Brooklyn in the Eastern Conference semifinals. That would be the same Brooklyn Nets team that swept Miami in their four regular-season meetings, and led by championship-certified veterans Kevin Garnett and (LeBron James nemesis) Paul Pierce, had been a popular pick to end the Heat’s run at a third straight NBA title. 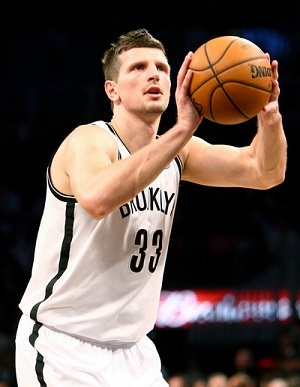 While the Nets’ All-Star foursome of KG, Pierce, Deron Williams and Joe Johnson will be the first called upon to make this series competitive as it heads back to BK for Games 3 and 4, the player who could really swing the series in Brooklyn’s favor is Mirza Teletovic. The 28-year-old small forward, a Muslim from Bosnia and Herzegovina, is in his second year in the NBA after previous stops playing pro ball in Belgium, Spain and in his home country. Teletovic didn’t play much in his first season with the Nets, but this year he became a crucial part of the rotation, averaging 19 minutes and 8.7 points per game in the regular season. After an ineffective Game 1 against Miami, Teletovic scored a team-high 20 points off the bench in Thursday’s Game 2, hitting six three-pointers. His outside shooting stretched Miami’s swarming defense and forced the two-time defending champs to make adjustments for a player that surely hadn’t game-planned for going into the series. Teletovic scored 20 or more points five times during the regular season, averaging 5.6 threes per game in those outings. The Nets went 4-1 when Teletovic cracked the 20-point barrier. He averaged 10.3 points in three regular-season games against Miami, including a 17-point effort in a March 12 victory in which Brooklyn was playing without forwards Garnett and Andrei Kirilenko. The 6-9, 240-pound Teletovic is also one of the defenders Brooklyn coach Jason Kidd uses to show LeBron different looks, and Teletovic has been able to frustrate LeBron at times with his physical style. The Nets have a task in front of them that now looks almost impossible with the rhythm Miami is in, but they have two straight home games coming up and almost equivalent experience of a championship club with some of their veterans. Pierce and Garnett and Johnson and Williams will have to carry Brooklyn up to Miami’s level if they are to get back in this series, but Teletovic might be the one to put them over the top.